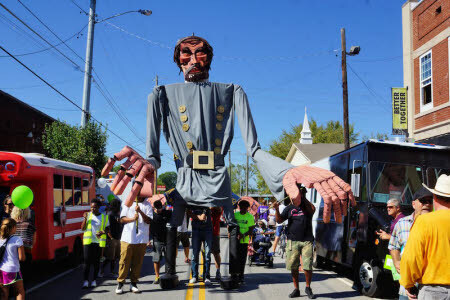 The Shaking Ray Levi Society and Tenn Arts announce the grand opening of Wayne-O-Rama on Saturday, Nov. 19, from 2-7 p.m. 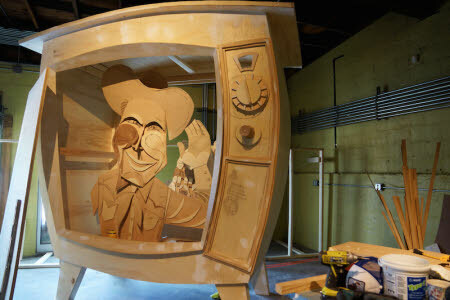 This yearlong installation by 4-time Emmy Award-winning artist Wayne White will astound and amaze as guests experience a Chattanooga history funhouse, said officials. Sponsored by See Rock City, Inc. with support from the Benwood Foundation, the Footprint Foundation, Lyndhurst Foundation and the McKenzie Foundation, these larger-than-life puppets and installations depict Lookout Mountain, Chief Dragging Canoe, Bessie Smith, Chattanooga broadcasting legend Bob Brandy and a host of notable Chattanooga figures. The Grand Opening celebration is free and open to the public. It will include a ribbon-cutting, the presentation of a joint city of Chattanooga and Hamilton County proclamation declaring the day “Wayne White Day of Art and Education,” and remarks by public officials, corporate sponsors and Wayne White. After the grand opening, Wayne-O-Rama will be open to the public at the Tenn Arts studio at 1800 Rossville Ave., #108, Wednesday-Sunday from 11 a.m.-6 p.m. until September 2017. The suggested admission price is a donation of $12 for adults and $5 for students/seniors, but no one will be turned away due to lack of funds. 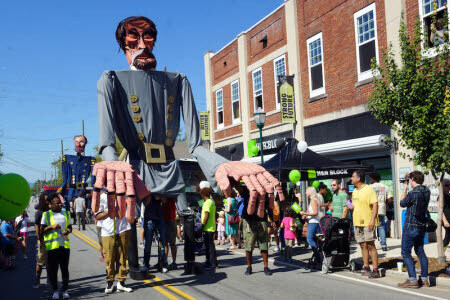 Donations will sustain Wayne-O-Rama and be used for operating costs and its educational outreach programs. The celebrated artist Wayne White — who has won four Emmy awards (three were for his art direction on Pee-Wee’s Playhouse) and is the subject of the acclaimed 2012 documentary Beauty Is Embarrassing — was born and raised in Chattanooga, and despite the numerous accolades and attention he has received, he has never forgotten where he came from. 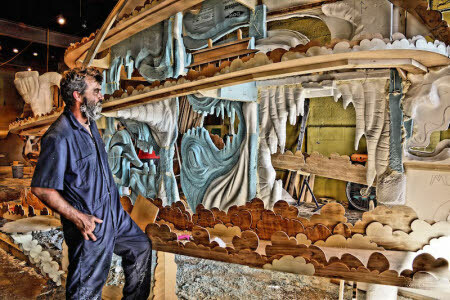 Mr. White currently is enjoying recognition in the modern art world for his masterfully created word paintings and for his elaborate, astounding installations, fantastic, awe-inspiring spaces with giant puppets and incredible sculptures. He built his reputation as a world-class illustrator, animator, set designer, puppeteer and art director but he is a Chattanooga boy at heart, with a desire to both inspire and honor the city that helped to shape him into the artist he is today. Mr. White says “Wayne-O-Rama is a wonderland, straight from my imagination to yours. 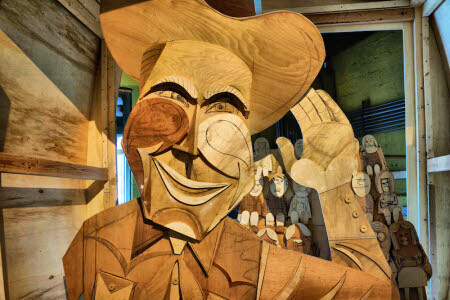 It is a funhouse for all ages that tells the story of Chattanooga and the South. It’s the Smithsonian Museum meets Goony Golf. It’s a celebration of the culture that shaped me and a gift to my hometown. 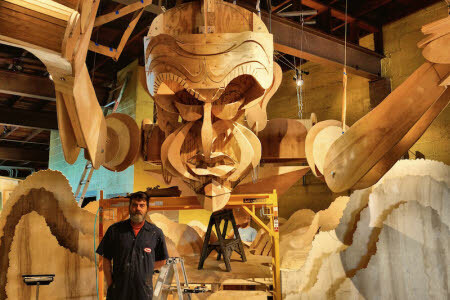 I will use giant puppets, large-scale dioramas, peep shows, paintings and animation to tell the story of the region from pre-history to the present.” Over 300 artists from here and beyond have worked under White’s direction transforming wood, Styrofoam and cardboard into a fabulously detailed celebration of hundreds of years of Chattanooga history. For more information please visit www.wayne-o-rama.com or Wayne-O-Rama Chattanooga on Facebook. To volunteer or schedule group visits please email project manager Bob Stagner at wayneoramacha@gmail.com. The Shaking Ray Levi Society is a funded agency of Arts Build of Chattanooga.